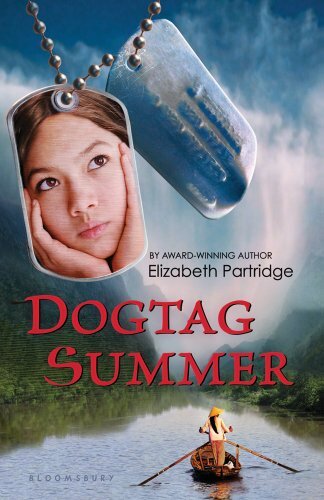 Dogtag Summer brings to life a piece of American history so recent and so raw that most kids won’t get to study it history class, and it does so in a way that is both emotionally wrenching and thought-provoking. A half-Vietnamese girl brought to America at the end of the Vietnam War, Tracey lives with her adoptive parents in a small town on the California coast. It’s the summer before middle school, and Tracey looks forward to long days of freedom with her brainy best friend Stargazer and his peace-loving, vegetarian family. Together the friends are going to build a replica of a Viking funeral ship and launch it, burning, onto the river. When Tracey begins to remember scattered images of her life in Vietnam, her sense of dislocation increases. Then she and Stargazer discover an old ammunition box and a military dog tag in the garage. Finding them snooping, Tracey’s father reacts with a cold fury that sends him deeper into his drinking and withdrawal. By this time, Tracey’s memories portray not only rice paddies and fishing, but hunger, loss, and flight. The more she tries to delve into her past, the worse things get, until her parents are fighting, and she’s no longer speaking to Stargazer. It takes persistence, courage, and a nighttime rescue for Tracey to break through to her father so they both can face the past, even though the past may never be fully healed. A book about a person divided between two countries needs to convey a strong sense of place, and Dogtag Summer does so elegantly. From the hut by a brown river where Tracey and her grandmother used to fish and gather snails, to the steamy trailer where Stargazer’s family lives with two dogs, to the swimming hole where the children swim until they’re “too cold to move”—lovely prose descriptions root the story. The characters, too, are well-drawn, and even the adults are three-dimensional. Although Tracey herself seems rather blank at first, that may be because she literally doesn’t know who she is: She gains depth as she struggles to learn more. In view of Tracey’s courage, it is disappointing that the author never fully deals with the question of what ultimately became of Tracey/Tuyet’s mother in Vietnam. Perhaps Partridge concluded that she had already filled Dogtag Summer with enough sorrow. Dogtag Summer includes a question-and-answer appendix about Vietnam, the war, and what happened to the children American GIs left behind. There is also a teacher guide with discussion questions. With these appendices as a launching point, parents may want to start their own discussions about war and its effects on society and families with children who have read this well-written and thoughtful book.